Last weekend the spring weather was perfect for the annual Dogwood Arts Festival, sunny and a bit breezy. I last attended 2 years ago and shot this image. Many booths post signs saying no photography of their wares is allowed which forces you to look for other things to shoot. I am often struck by scenes of people viewing the art and try to grab a shot before the people move on. 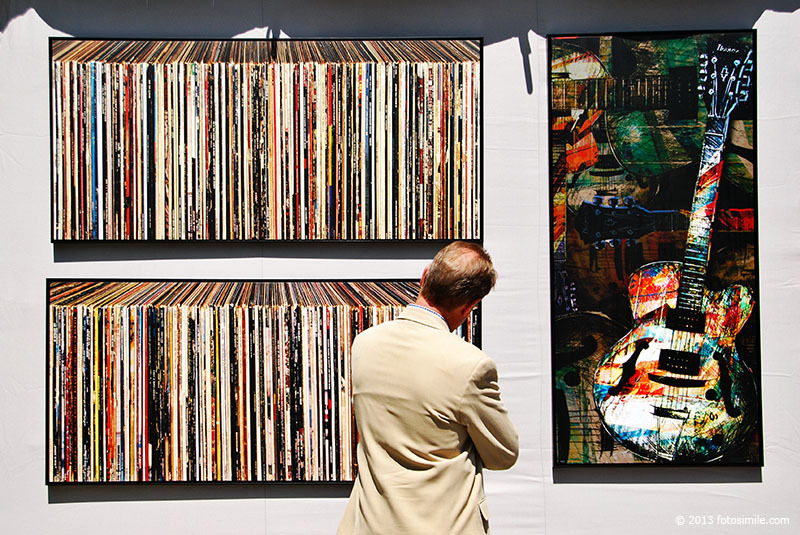 This man looked lost in memories as he examined more closely these intriguing paintings of record albums with the names of many iconic musicians from the 60s, 70s and 80s. I even still own a few of the album names I saw in the paintings. Repetition seemed to be a theme in artwork this year as I also saw another artist's paintings of books lining bookshelves, albeit somewhat abstracted. Unfortunately I wasn't able to grab a shot but you can see that artist's work at jabrem.com.